This week’s “Ftag of the Week” is part of the Quality of Life regulatory group, F679 Activities Meet Interest/ Needs of Each Resident. The regulatory requirement has been updated under the new RoPs to state that “based on the comprehensive assessment and care plan and preferences of each resident,” facilities must provide ongoing resident-centered activities programming to “support residents in their choice of activities” that have been designed to meet the individual interests of the residents while encouraging both independence and interaction in the community. Activities must be meaningful and incorporate the resident’s interests, hobbies and cultural preferences. The Interpretive Guidance (IG) states that activities are considered “meaningful” when they reflect the resident’s lifestyle and interests, are enjoyable to the resident, help the resident feel useful and provide the resident with a sense of belonging. For residents living with dementia, the IG further states that activities for PLWD must be individualized and customized based upon the individual’s previous lifestyle, preferences and comforts. The IG contains a multitude of examples for activity interventions that facilities can try for different residents and is a good starting point for some ideas. The outcome for activities, per the IG, is that there is either a decrease/elimination of a behavior, the validation of the activity intervention or shows that something different needs to be tried for that resident. This means that care plan interventions and planned activities need to be updated based on these outcomes to better meet each resident’s needs. During survey, surveyors will utilize the Activities Critical Element Pathway to ensure that the activities for each resident are person-centered and support his/her well-being. 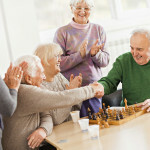 Facilities need to ensure that they include specific information about how each resident prefers to participate in activities that meet his/her interest, if special adaptations need to be made for participation, and how activity programming is adjusted to accommodate the needs of residents with varying levels of cognition and capabilities. Also note that surveyors will be conducting observations to see if residents are engaged and whether the activities are compatible with their known interests/preferences. Resident engagement should be a facility-wide goal with staff participation from all departments feasible; an “activity” does not need to be led / directed by a member of the Activities / Therapeutic Recreation Department. And remember, there are also a variety of community-based activities, such as shopping, local concerts, church services and visits to the library, that afford a resident the opportunity to pursue lifelong interests, spirituality as well as meet their goal, needs and strengths. Your team should be conducting an assessment that identifies this information.